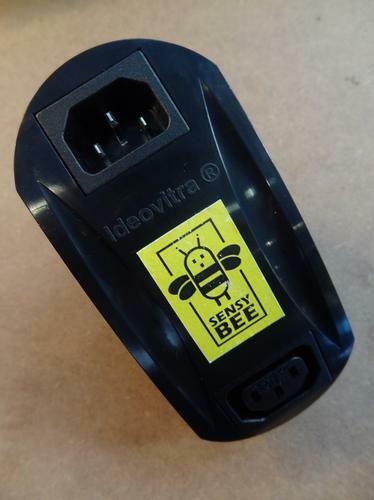 SensyBee from Ideovitra is designed to eliminate PCs' vampire power consumption. It learns how a PC uses electricity and turns it off when it is unused. There's a vampire-slayer stalking the halls at Cebit. With SensyBee, a curvy little box that plugs into the back of a PC between the power supply and the wall outlet, turning the PC off when it is unused, Ideovitra hopes to eliminate PCs' vampire power consumption. A typical desktop PC consumes around 200 watts when running -- but still as much as 50W when in Windows 8's "sleep" mode. Even when "turned off," it can consume up to 20W, as the power supply and some other components remain powered up to perform functions such as wake-on-LAN, said Ideovitra's sales manager David Chedotal. In the 6,500 hours a year that the average office PC lies unused, that vampire power consumption can add between 130 and 325 kilowatt-hours to the energy bill. At German electricity prices, that's anywhere from €30 (US$32) to €90 wasted each year, according to Ideovitra. The SensyBee contains a tiny microcontroller -- the same type as is used for monitoring solar panels, said Chedotal -- that learns a PC's power consumption patterns and shuts it down each night when not in use, waking it up again ready for work the next morning. SensyBee can also communicate with an infrared movement sensor in order to turn the PC on again if someone arrives for work early in the morning. It has an extra outlet for controlling the power to peripherals such as monitors or printers too. With an additional cable, the SensyBee can send a signal to a PC in sleep mode, telling Windows to shut down completely so that it can be turned off safely, Chedotal said. At a cost of €70 per PC, purchasing something like the SensyBee seems like a no-brainer: Even in countries with cheaper electricity than Germany, the investment can be recouped within as little as 18 months, said Chedotal. SensyBees can communicate with one another and with the infrared movement sensors through a wireless hub. The devices must be paired with one another and communications are encrypted, preventing pranksters from shutting down PCs unannounced, he said. For home users, it's also possible to pair a SensyBee with a movement sensor without a hub: One movement sensor can control up to 10 PCs. A wireless movement sensor costs around €40, a wired one suitable for a single PC just €25. There are a few caveats: If your organization delivers software updates to PCs at night, using wake-on-LAN to reboot them, then SensyBee is not for you. And if you don't have a regular routine, SensyBee may not be able to learn when it is appropriate to shut down your PC. Ideovitra has a way to address that problem: If you live in a country with a lot of holidays, for example, you can tell SensyBee which days to shut down completely using a web interface. It's also possible to nominate one PC that all the other devices in an office will follow, turning off when the boss goes home for example. The SensyBee is full of deft touches like that: The power plug can be rotated so the case doesn't obscure the PC's fan, while an RJ45 socket serves as an Ethernet port for connecting the devices in large offices -- or to power the wired movement sensor and receive a signal when someone is present in a single-PC installation. Ideovitra has just begun volume production of the SensyBee and has units ready to ship, said Chedotal.